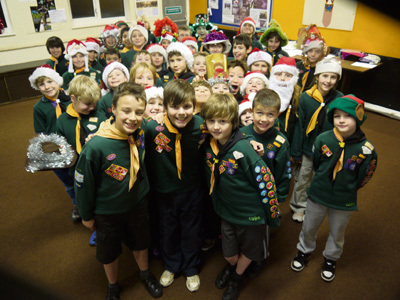 Cub Scouts from both 1st Saltford packs had plenty to celebrate at their Christmas party when three youngsters received the Chief Scouts’ Silver Award. District Commissioner Janet Turner presented the honour, the highest available to Cub Scouts, to ten-year-olds Josh, Harvey and Sam. The youngsters had to complete six challenges, gaining new skills and taking part in new activities. As part of their work towards the award, Josh talked to the other Cubs about cricket, Harvey took part in outdoor activities, including hiking, and Sam went camping. A fourth award was also handed out on the night, with Henry from Tigers Pack taking the prize for best Christmas hat.